The changes happening in Hollywood won’t be obvious on the Academy Awards red carpet on Sunday, with sexual harassment and assault scandals looming over Hollywood. But behind the scenes — in coffee shops and in boardrooms — the #MeToo movement is showing signs of spurring real change just five months after the first public allegations emerged against Harvey Weinstein, once one of the industry’s most powerful producers. "Studios have put out the APB, ‘Let's find women directors and line producers,’” Frank Smith, president of the movie production company Walden Media, said. “They want to work with top quality women and people of color. The message is: We heard you loud and clear." 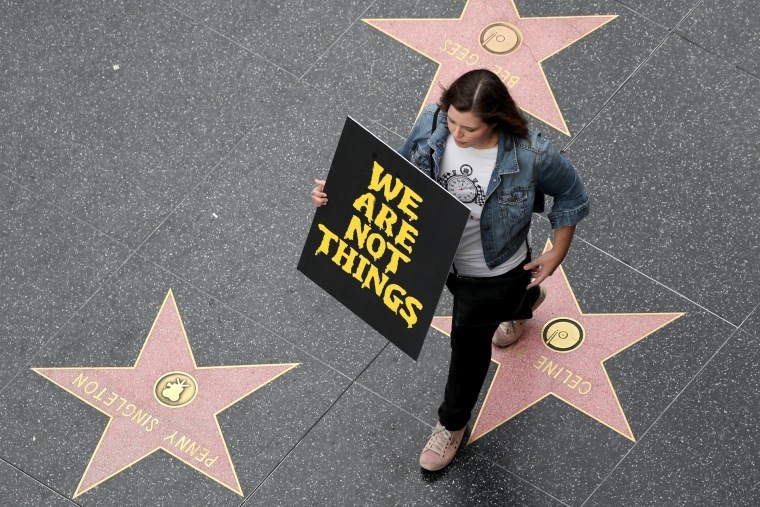 Despite the near-weekly emergence of new allegations against powerful men in entertainment, Hollywood could yet set an example for how to deal with systemic sexism. Film and TV studios, networks, streaming services, talent agencies and public relations firms — many of which looked the other way while men created toxic work environments — are trying to make a lasting difference. Michelle Kydd Lee, chief innovation officer for Creative Artists Agency (CAA), said its talent representatives have been on a roadshow with their business partners, sharing data about the movie- and TV-watching public and arguing that it’s in the studios’ own business interests to change the makeup of productions by including women and minorities in front of and behind the scenes. "CAA has been going to the studios to present findings and saying, ‘So here's why it makes business sense,’” Lee said. “We're not coming to them saying it's a nice thing to do." Influential organizations across the board have been updating their rules with the idea of encouraging members to stop bad behavior when they see it. The Producers Guild, the Directors Guild, the Screen Actors Guild and the Academy of Motion Pictures Arts and Sciences have all instituted new codes of conduct. And companies are frequently putting women in jobs after men have been pushed out. Amazon Studios replaced Roy Price as president with NBC Entertainment’s president, Jennifer Salke. Price quit after making inappropriate comments to women. Many of the women-led groups that have been created in the past few months are gearing up for the long haul. The Time’s Up movement is adding regional chapters and said Friday that it had raised $21 million to help people mount legal cases against harassers. It’s also starting a project to record and disseminate women’s stories of workplace inequality. Ashley Judd will be the first to participate, according to the Hollywood Reporter. A separate project called 50/50 is aimed at encouraging companies to have 50 percent women on their boards and in senior positions by the year 2020. Vice Media has signed on to the initiative as have several talent agencies, including Creative Artists Agency (CAA), United Talent Agency (UTA) and International Creative Management (ICM). Anita Hill's new entertainment industry group, the Commission on Sexual Harassment and Advancement of Equality in the Workplace, is also making progress. It is looking at technology as a way to track harassment allegations, according to Deadline Hollywood, an online industry publication. Even Weinstein’s own company will now be headed by a woman, a happy ending that almost didn't happen as the company had been expected to file for bankruptcy this week. On Thursday, Maria Contreras-Sweet, a former administrator of the Small Business Administration in the Obama administration, finalized a deal with the board of the Weinstein Co. and the New York attorney general to pay $500 million for the company, including debt, with the aim of creating a victim's fund and board. Outside of these public efforts, there’s a sense across Los Angeles that a corner has been turned. Ending harassment and figuring out the new rules of the road are the dominant topics of discussion. The result is that lawyers are the busiest people in town, and general counsels at big Hollywood firms begin their day perusing the latest lawsuits, a list that grows by the day. Jane Rosenthal, co-founder of the Tribeca Film Festival and a veteran filmmaker behind such hits as “About a Boy,” and “Wag the Dog,” said the shift in culture has been notable. "So many of us have had to play by unfair rules,” she said. “That's not acceptable anymore, and that's exhilarating and exciting." Whether the movement maintains its momentum may depend on how active its supporters are.